John Deere’s C.E.O. was on hand for today’s dedication of a three-story, 145,000 square foot addition to the John Deere Credit headquarters in suburban Des Moines. John Deere Credit was formed in 1985, but Sam Allen, the new president and C.E.O. of John Deere, says its roots go back to the Great Depression when the company began extending credit to farmers. A package of state and city incentives — including $2.4 million in tax credits from the state — helped finance the $30 million expansion of John Deere Credit’s world headquarters in Johnston. The company now offers financing on everything from combines to lawnmowers and even offers loans for home landscaping projects and crop insurance. John Deere Credit has more than 2.4 million loan accounts. It’s loan portfolio is nearly $23 billion according to a company news release. Jim Israel, president of John Deere Credit, says the division has grown significantly since it moved into central Iowa over two decades ago. “It is absolutely amazing to think that John Deere Credit came to West Des Moines in 1986 with a total worldwide employment of 90 employees,” Israel says. 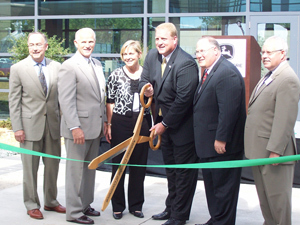 “…When we constructed the 24,000 square foot headquarters here in Johnston in 2000, we moved in the building with 745 people.” Today, John Deere Credit employs over 1900 people in 19 different countries. About 1,100 are based at the Johnston, Iowa, headquarters. A ceremonial ribbon-cutting was held in an outdoor pavilion decorated with a distinctive statue of a group of deer jumping in the air — similar to the deer that’s on the company’s logo. Governor Chet Culver was on hand for the event and Culver told the crowd of more than a thousand that economic development wasn’t a partisan issue. “All of us, especially during these challenging economic times, are focusing on doing all we can every day to focus on job retention and job creation,” Culver said. “So that’s why I’m so honored and privileged to be here as we…celebrate the fact that 125 new, very good-paying jobs will be created as a result of this expansion here at John Deere Credit.” State economic development officials say the average wage paid to those who work at John Deere Credit is $66,000.